Wow what a busy time we have had! *In this Edition we look at three tracking devices. GPS and Bluetooth, cheap and expensive! 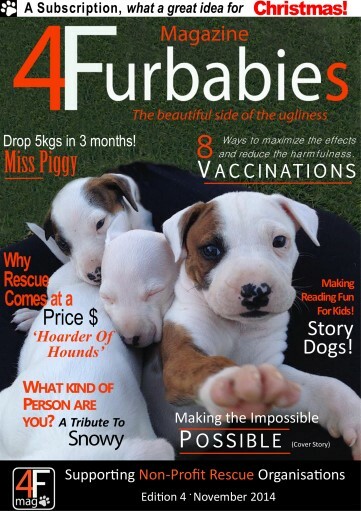 *In ‘My Say’ this month I discuss the moral, emotional and financial implications of a pet diagnosed with cancer. When do we say, enough is enough and stop treating them? 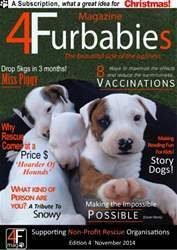 *Vaccinations: Yes there is a bad side to them and there seems to be the new practice of not vaccinating your pet. Dr Elaine explains the bad and good with a balanced informative view. * Have a pet who is overweight. We have been there twice now. Well Miss Piggy, the Pug, shows us how it is not good for your pet to be overweight and how you can do ‘Doggy Weight Watchers’ for them! *Six pups and no mum, equals a lot of sleepless nights! Not for this clever group. Red Collar Rescue finds a solution that is priceless! “I Cried….” yes and you will when you read this account of rescuing pups. Straight from the heart! *Rescue comes at a price. Be it emotionally, physically or financially! Dog Rescue Newcastle tell us the story of the Evil Old Man (Hoarder of Hounds) and the heavy cost involved. *South Coast Animal Rescue tells us there story! This group are in rural Australia and rescue livestock. Did we know that our livestock need rescuing? The answer is yes and will shock you!! *Did you know there is a group that helps children to read with dogs? Story Dogs is achieving just that! Sooti and Lenna share their story. * To see the look of sheer joy on a dog’s face after being sprung from the pound is a big motivating factor for Rescue Groups! Meet Hooch, no one does it better!! Don’t miss your Pets Horoscope for this month!